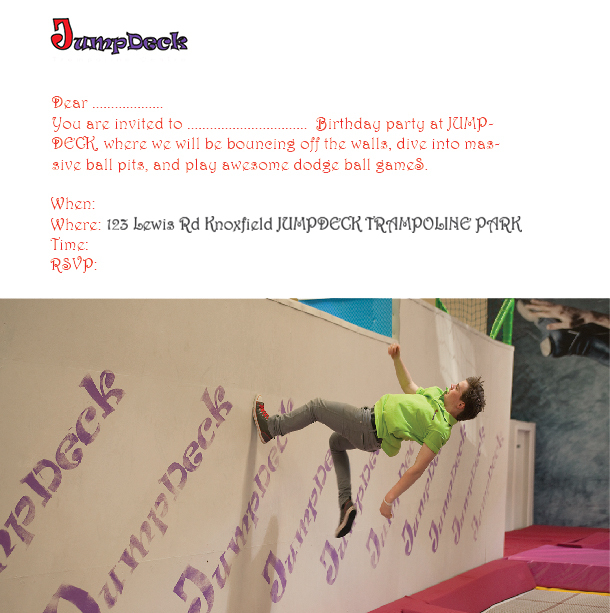 Book your Jumpdeck party with us today! UPTO 3 HOUR PARTIES AVAILABLE NOW ! Jumpdeck specialize in a stress free, mess free party experience. From the moment you arrive, your party host will take the reins and leave you time to relax...or get some Jump time in! Your party can stay together and experience each area Jumpdeck has to offer. Your dedicated party host will give the kids an hour's exclusive time in the Ball pits and Cushion Central, the Free and Super Jump areas and Play as much Dodgeball as they like. On next, to one of our private party rooms where the celebrations continue, your host will ensure the children enjoy some awesome party food have the time of their lives!